Irina Lyakhovskaya was born in St. Petersburg, Russia. She graduated from the St. Petersburg Conservatoire in 1999 where she studied with Alexander Sandler. In 2000, she was invited to continue her studies in England as a postgraduate scholar at Trinity Laban Conservatoire of Music and Dance (then known as Trinity College of Music) with John Bingham. In 2003 Irina won first prize in the TCM Association’s Soloist Competition with her interpretation of the Schumann Piano Concerto. Since then, she has given many performances at leading international venues including the Philharmonic Hall in St Petersburg, Smetana Hall in Prague and the Coliseum in Porto. In the UK, she has appeared at the Southbank Centre, Symphony Hall, St John’s Smith Square and Cadogan Hall performing solo recitals and as the concerto soloist in Mozart, Haydn, Schumann, Brahms, Tchaikovsky, Rachmaninov and Scriabin concertos. Currently Irina is artist in residence at Eastbourne Arts Centre where she is performing complete Beethoven piano sonatas in 8 concerts. Her work has also been broadcast on BBC television and radio. An active chamber musician, Irina performs internationally with violinist Eleanor Percy, with whom she has given numerous recitals at the Wigmore Hall in London. They have recorded sonatas by Brahms and Prokofiev for the ImLab label, and the complete Mozart sonatas for Melodiya. 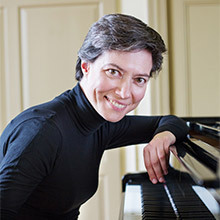 Irina has worked at Trinity Laban as a professional accompanist since 2002.